Fortuitous discoveries make for fun traveling. This was certainly true for us as we meandered through southwestern Wisconsin and up the Mississippi River on our Octoberfest Beer Tour. And since it was a brewery tour, of course it’s only appropriate to say we learned a lot about the beer industry (as we partook in some mighty fine sipping). For example, I know a lot of corporate brand buying and selling occurs in today’s monopolized beer industry. But I didn’t realize this exchange has gone on for generations, even among small breweries. Take Berghoff, an authentic German style beer with a great Midwestern heritage: Since it’s beginnings in 1887, it’s been brewed by the Herman Berghoff Brewing Company, Fort Wayne, Ind., the Falstaff Brewing Company, St. Louis, Mo., the Joseph Huber Brewery (now Minhas), Monroe, Wis., the Walter Brewing Company, Eau Claire, Wis., and now the Berghoff Brewing Company in Chicago. Imagine the diversity of deals settled throughout history, all in the name of fermented grains! Another bit of beer history we learned was the extent to which ales were brewed, especially in Wisconsin and other Germanic-influenced states. According to this article, in the late 1800s breweries were as much a part of Wisconsin communities as churches and schools. My own town of Watertown has record of nine different breweries and we’ve all heard stories of the underground tunnels, some of which still exist. So, as we wrapped up our tour, my husband and I were especially excited to share the fun of new discoveries. 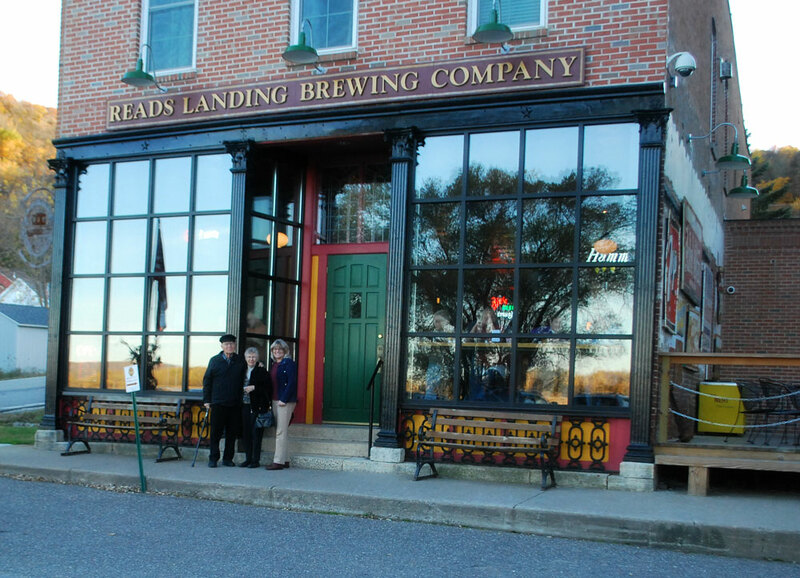 For our last stop we hopped across the river and, together with my dear aunt and uncle, checked out Reads Landing Brewing Company in Reads Landing, Minn. Even though my aunt and uncle live a short jaunt up the road, and even though they’d driven through Reads Landing many times, they never knew this little gem existed. We had a great time and the food and drinks were delicious. It was a full house when we visited yet owner/brewer Bob Nihart took the time to chat with us about his beer, which he brews three barrels at a time. He didn’t have any Oktoberfest on the menu, but we liked his Cap’n Amber and American House Pale Ale. Gorgeous! 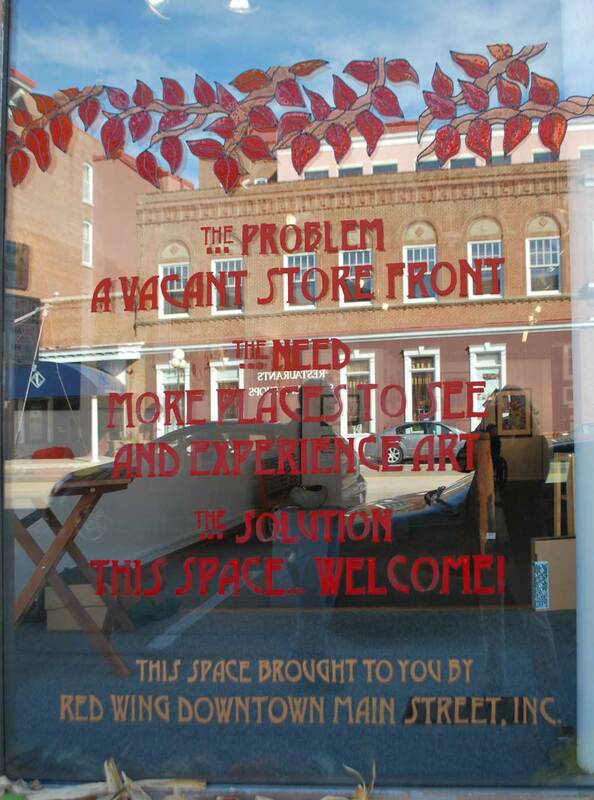 According to Reads Landing’s website, its 1869 building was formerly a dry goods store and has been in the family since the 1930s. They’ve done a fabulous job preserving its character and structural soundness. The restaurant overlooks the Mississippi River and the large storefront windows offer a beautiful view. The décor was fun and fitting. The food was good, hearty bar fare. I’m extending the Reads Landing community to include the surrounding river towns, since the whole area is truly beautiful. Although Reads Landing is unincorporated and I can’t even find a population, its neighboring towns are much larger. We spent several hours in Red Wing, which is just 30 minutes away and we attended church at Salem Lutheran, Woodbury, another 30 minutes beyond that. I’ve previously mentioned how much I like Read Landing’s logo. After visiting, I love it even more. Everything about it fits the business’s brand perfectly. It’s website is also well done, with lots of good information on the restaurant, beer and the area. 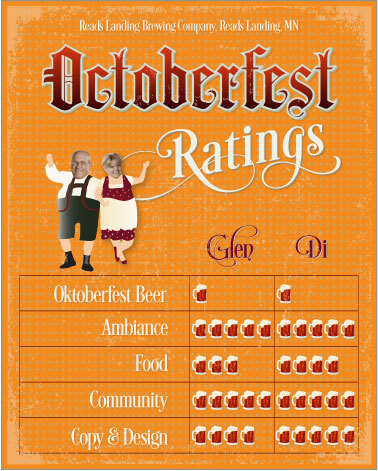 Well, that’s it folks—our 2014 Octoberfest Beer Tour (said with a melancholy sigh). It’s been so much fun, we’re thinking we could make it an annual event. Maybe we will! SO interesting! LOVE the ratings and the writing! Thanks for sharing this delightful adventure! Thanks Deb. I thought of you, knowing you travel these parts so much! Looks like you had a wonderful vacation. The fall colors were so beautiful this year!